Donate Now and Receive Your Copy, Too! AE911Truth is doubling down on our critically important mission to educate the architecture and engineering professions about the truth behind the World Trade Center destruction. And we won’t let up until our professional associations and other institutions recognize the need for a new, independent, unbiased investigation. 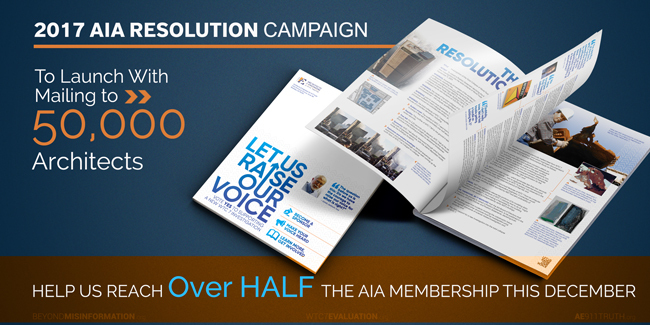 The next step in our unyielding pursuit is to reach more than half of our fellow members at the American Institute of Architects (AIA) this December with a mailing that will announce the launch of our third AIA Resolution Campaign. 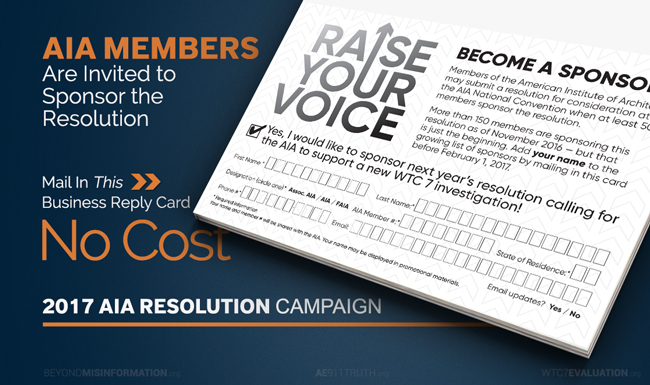 Just as we’ve done at the past two AIA National Conventions, we’ll be submitting a resolution, sponsored by hundreds of architects, calling upon the AIA to officially support a new WTC 7 investigation. We invite you to view our impressive mail piece, which will soon be on the desks of 50,000 AIA members. It is, by far, our largest mailing ever. For the first time, we’ll be contacting over half the members of a given professional organization. 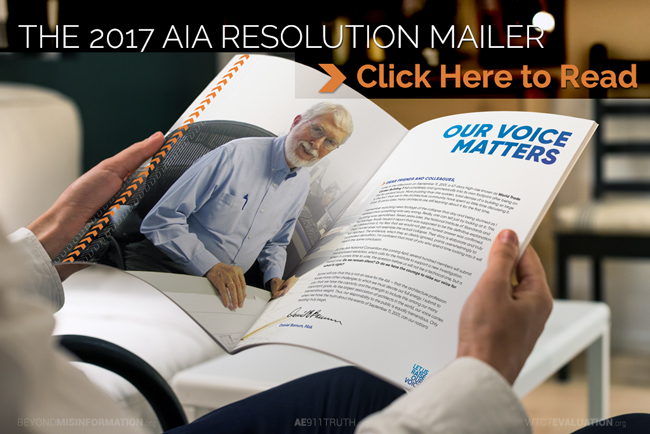 It will feed directly into our ongoing effort to pass the AIA resolution, channeling the impact of our mailing toward a specific, measurable outcome. And here’s where it gets very exciting: We're making it extra easy for recipients to add their names as sponsors of the resolution. All they need to do is fill out the enclosed prepaid “business reply card” and pop it in a mailbox. Because of our recent grassroots outreach, there are now more than 175 members of the AIA — architects of the highest integrity — sponsoring this resolution. We hope to at least double that number in the coming months. At a cost of only $1 per recipient, we’ll be able to educate nearly 60% of the largest association of architects in the world. With this mailer, gone are the days when only a small minority of the AIA membership know about WTC 7 or the work of AE911Truth. You can support this unprecedented opportunity by making a modest donation, knowing that you'll be informing one architect with every dollar you give. As we’ve done with our past few mail campaigns, we’ll send you a souvenir copy of the mailer when you donate $25 or more by the December 15th deadline — or $30 if you live outside the U.S. This way you’ll get to see firsthand the powerful literature that you are putting into the hands of dozens of architects. In 2015, we won 4% of the delegates’ votes at the AIA National Convention. In 2016, we captured 11% — nearly tripling our total. In 2017, we expect another major leap forward, which will be in large part because of this mailing. Thank you for making it possible!